Island photography by Sara Harowitz. Ship photos courtesy of Ecoventura. With that, we zoom out onto the open ocean, where a few other pangas have gathered. As we get closer, I see a gust of air and water spray out from the animal’s blowhole. My heart begins to race—this is the first time I have ever seen a whale in the wild. We follow the sound and sight of the blowhole in our little pangas, getting close enough to see the amazing animal briefly breach its back up above the water. Being that close to a whale—a minke, to be exact—is the kind of thrill I was hoping for. 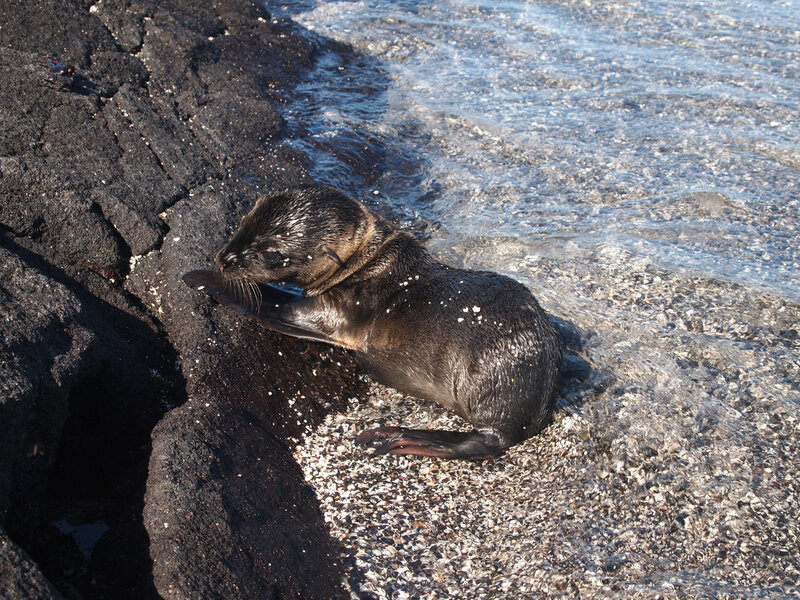 It’s the kind of thrill that lies in abundance in the Galapagos. We drove back to our boat, the MV Origin, and I returned to my cabin still buzzing with excitement. 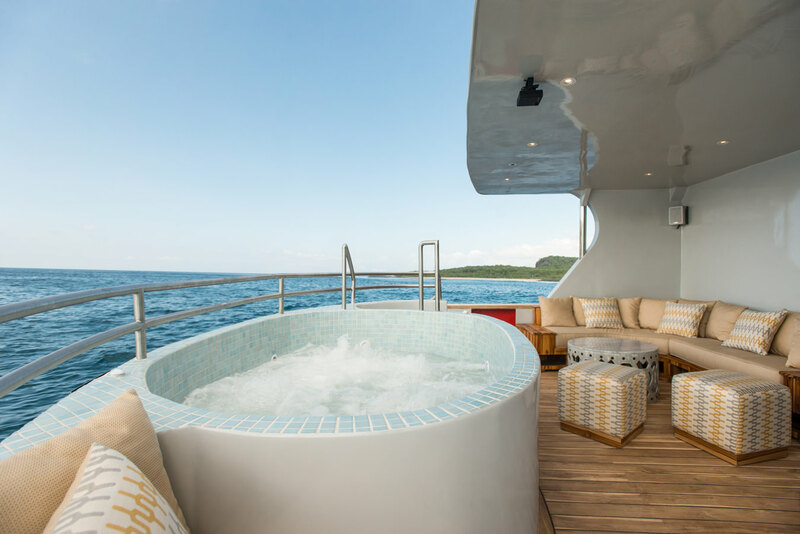 Really, the only way to properly see a good chunk of the Galapagos Islands is by boat, and Ecoventura’s new luxury yacht provides all of the adventure, along with fantastic amenities and creature comforts. 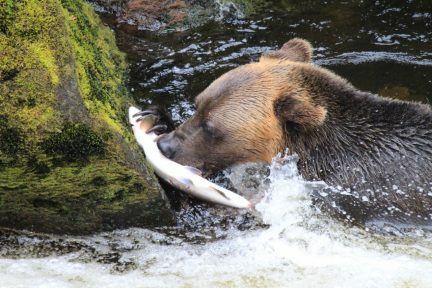 It allows you to see a whale up close and eat a four-course meal in the same day. 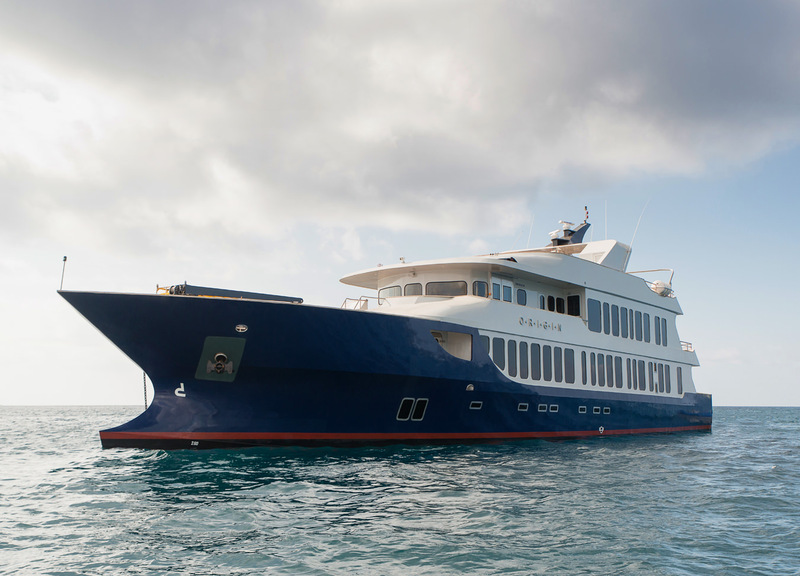 Ecoventura is an Ecuadorian-owned company specializing in adventure cruises throughout this remote and truly unique archipelago. 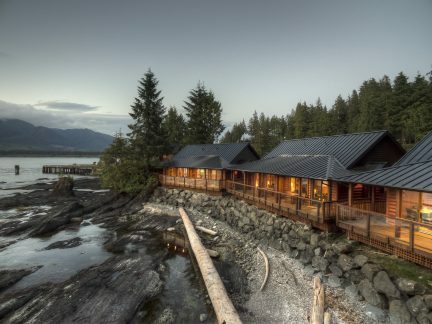 Offering two itineraries—one that goes southern-central and one that goes northwest—each seven nights in length (or keeners can opt to do both), Ecoventura gives its passengers a fun and sustainable way to travel. 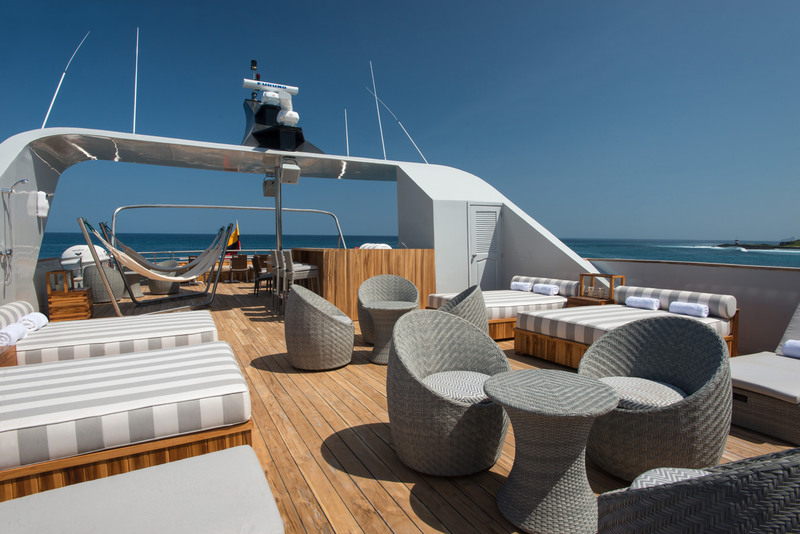 The newest member of its fleet is the Origin, a 20-passenger yacht that debuted in 2016. 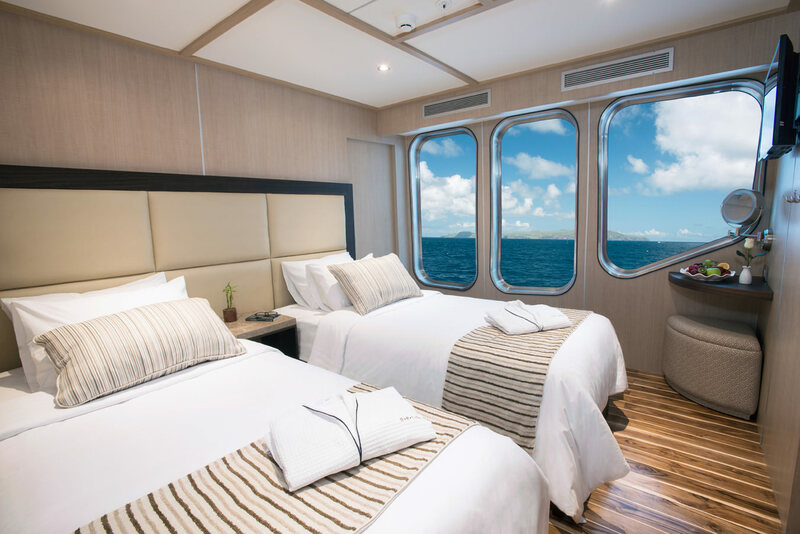 Here, deluxe staterooms with soft bed linens and Apple TV on the television make for happy sleeps at night and naps during the day; and a window in the shower means even getting clean reveals the incredible landscapes of the islands outside. 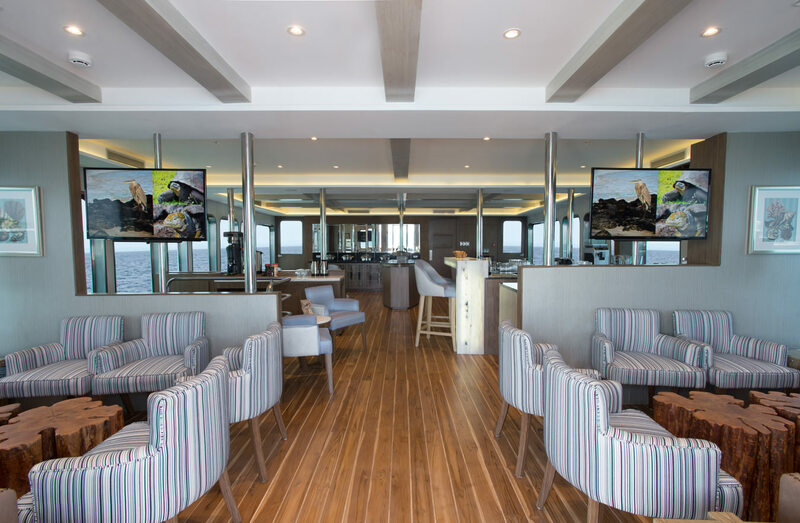 Origin passengers enjoy an open-bar policy, giving them a selection of wine and beer (specialty drinks can be ordered for an extra charge as well), and each meal aboard the ship is prepared with care and attention. I find myself looking forward to lunch each day, as the cook staff prepare fresh buffets of burritos, jerk chicken, fried plantains, and stew. Our dedicated barman, Christian, is always on hand to prepare a perfect cappuccino or pour a glass of red, and a shelf of wrapped snacks and treats is always restocked. At dinner, three- and four-course menus offer a mix of Ecuadorian and international dishes, each one beautifully plated. Indeed, we never go hungry aboard the Origin. Of course, the adventure occurs on the islands—the oldest of which date back over four million years—and right in the water. The Origin has plenty of activities planned to keep guests entertained throughout the day: nature walks, beach strolls, snorkel excursions, even the odd kayak or stand-up paddleboard jaunt. 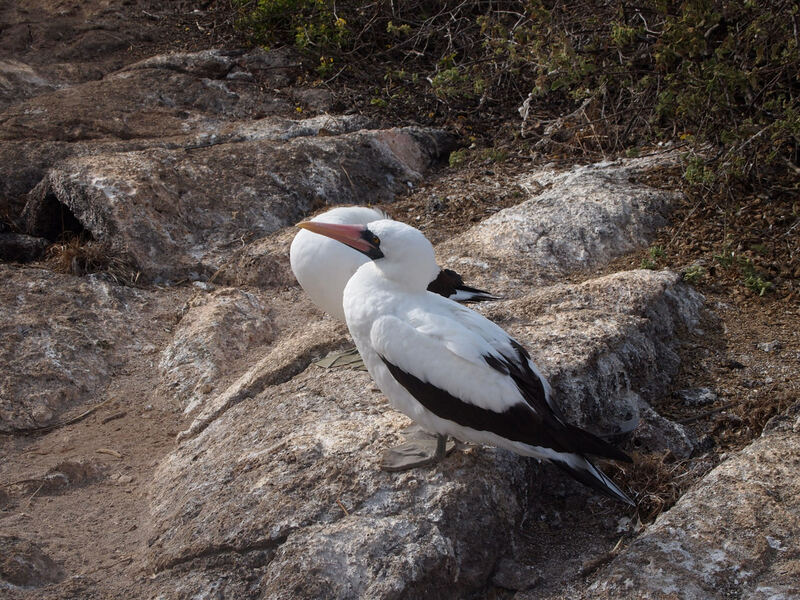 Every water and land activity must be led by a naturalist, who is registered through the Galapagos National Park, and these expert guides provide fantastic context, history, and understanding of the archipelago’s diverse ecosystems. 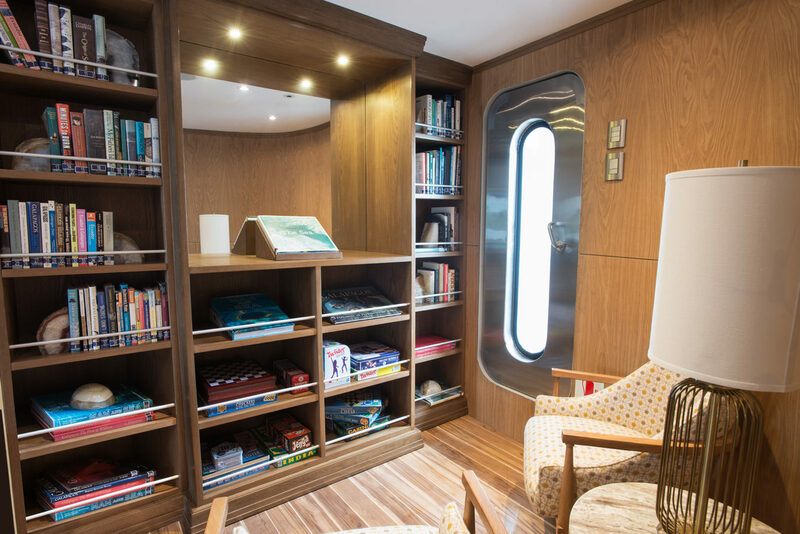 And because the Origin only holds 20 people, there is essentially one guide for every 10 passengers, creating an in-depth and intimate learning environment. Seeing how the finches on each island differ in beak length and size, or watching a marine iguana eat algae underwater, really brings Darwin’s concept home. 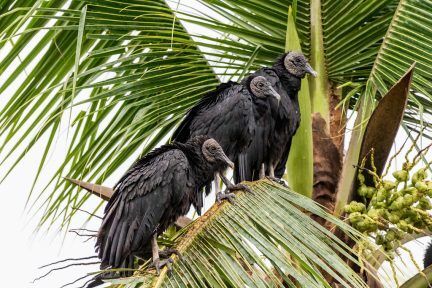 The days are jam-packed, but it allows guests to see an incredible portion of the islands and really begin to grasp the incredible feats that the wildlife have overcome to live here. 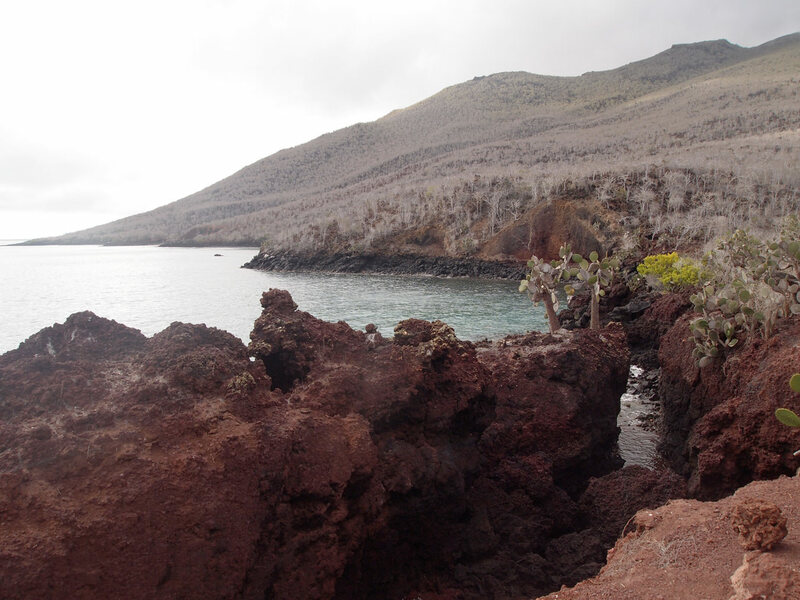 After all, this is where Charles Darwin sailed to in 1835 aboard the HMS Beagle, observing the animals on San Cristóbal, Floreana, Santiago, and Isabela islands. Watching how the creatures adapted to their surroundings famously inspired his theory of evolution, documented in On the Origin of Species. Seeing how the finches on each island differ in beak length and size, or watching a marine iguana eat algae underwater, really brings Darwin’s concept home. 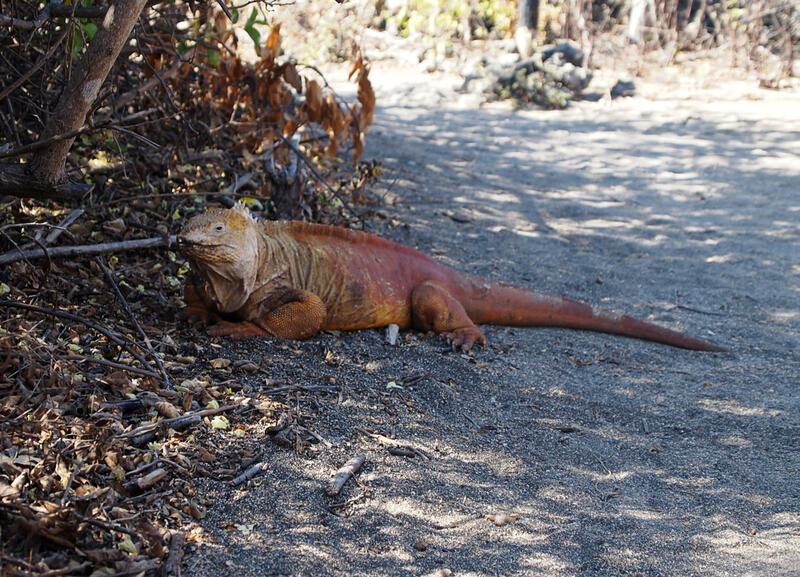 Visitors must keep to a specific path on the islands, and are not allowed to touch anything—these national park rules help protect the nature and the animals, ensuring they continue to thrive unaffected by humans. “The animals are innocent,” says naturalist Cecibel Guerrero. 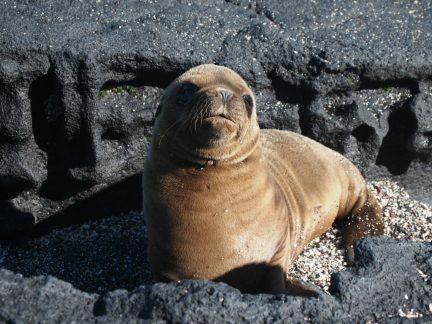 “They are unaware of what we can do to them.” As such, looking into the eyes of a baby sea lion or swimming next to a sea turtle are experiences that are not only possible, but actually plentiful. During one snorkel, a fellow Origin guest yells that a shark is nearby. As we all rush over to see it, I think to myself that this might be the only place on earth where humans swim towards sharks instead of away from them. 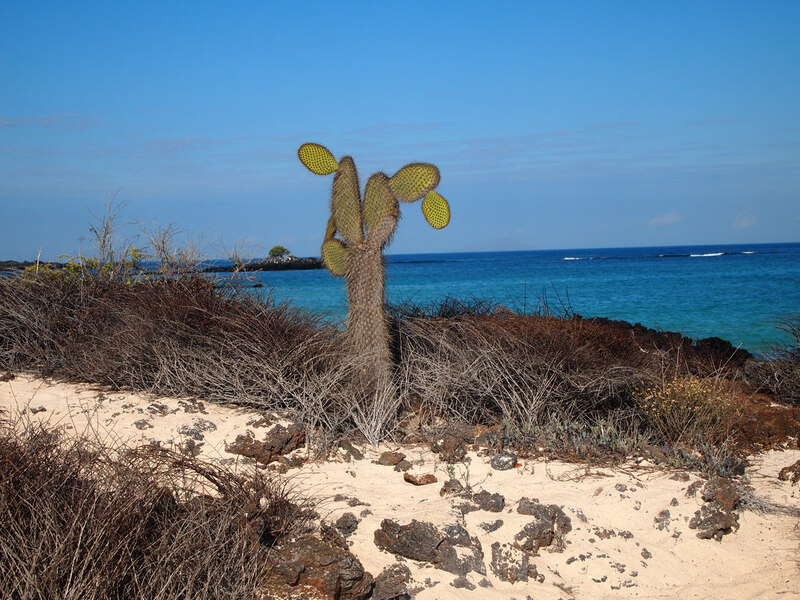 But that is the beauty of the Galapagos, and why such stringent rules are in place to keep things the way they are. 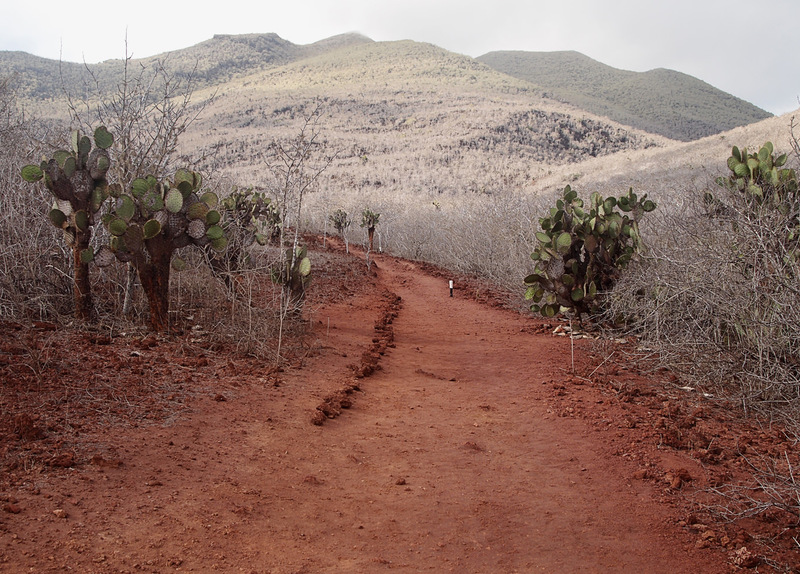 While on a walk along Bachas Beach on Santa Cruz island, one passenger points to a set of tracks in the sand and asks our other naturalist guide, Fabricio Carbo, what animal made them. “Those are Homo sapien,” he says. “The most dangerous animal of all.” Though said jokingly, there is some deep truth to his statement. Wandering around the islands, I can’t help but wonder how different they would look if humans were not allowed on them at all. Would there be even more mangroves, even more red-footed boobies? I tend to harbour a bit of self-inflicted guilt when I travel, mostly because I feel so privileged to see what I see. But the conclusion I come to again and again is not that I should stay home—it’s that when I leave, I should focus on understanding and respecting the new place I am in. The Origin and its crew does an incredible job of making guests feel welcome, but also of teaching them about these unforgettable islands and about Ecuador as a whole. With eco-friendly water travel, a low number of guests, and knowledgeable staff, the trip excels on a more meaningful level. Guests of Ecoventura come away with more than photos of flamingoes and encounters with puffer fish—they come away with a deeper appreciation for the earth.